Top: Matalan. 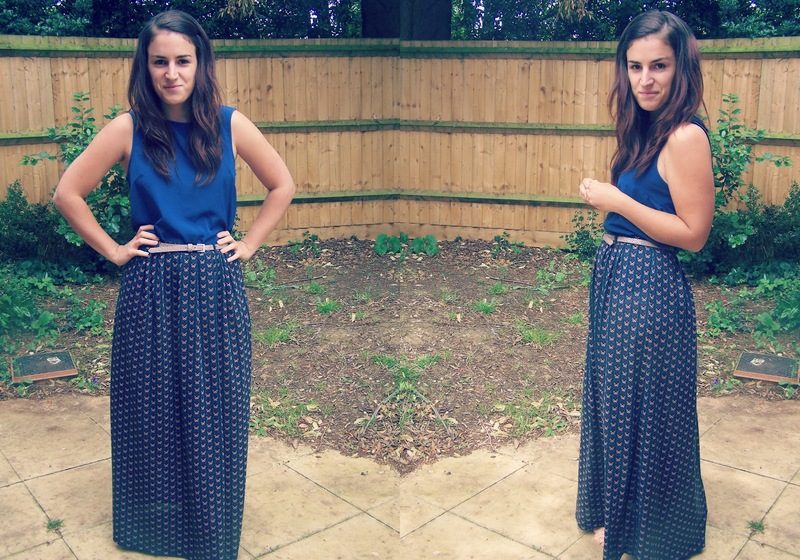 Maxi skirt: River Island. Belt: Matalan. Right I'm going to be well and truly British right about now, and moan about the weather. BUT SERIOUSLY, what is wrong with it?! Can it not make up it's mind at all? I know I'm bad at decision making, but hello, weather controller is far worse. And by that, I mean. I like the sun. I like to get my legs out. I don't mind the cold, I wrap up warm. But this awkward not cold enough for tights, but too breezy for short dresses, is no fun in the morning. Even Littlebum agrees. Honestly, I got changed 7 times before leaving the house today (Littlebum counted). I desperately wanted to wear my maxi, thinking it would be just the right outfit. But then I struggled. What to wear with it?! I've always struggled how to layer a maxi.. I'm forever eyeing up people wearing chunky knits, and beautiful jackets with them.. But I just look a right old plonker if I'm honest. So, yes, I waited till I got back home from my lovely afternoon, to change back into this, and sit in my garden drinking a milkshake. I really do live on the edge sometimes. P.S I'm selling some of my many clothes.. You can look here if you want to take them into a good home.